Please note that the content of this book primarily consists of articles available from Wikipedia or other free sources online. 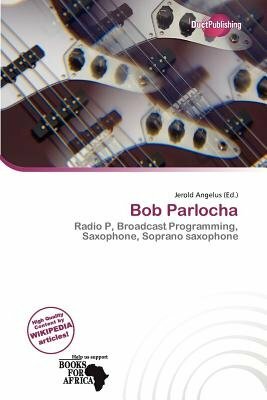 Robert "Bob" Parlocha (born in 1938) is an American jazz expert who, for many years, is best known as a radio host and programmer. He is also a professional saxophone player. Bob Parlocha was born in Vallejo, California in 1938, to a Filipino father and a half-black, half-Filipino mother. His mother was a fan of big band music (especially Count Basie and Duke Ellington), and introduced him to jazz at an early age. He grew up listening to former KJAZ owner Pat Henry (broadcasting at that time on KROW in San Francisco); and to Jerry Dean, who hosted a weekly KJAZ show from Vallejo. Contributing his voice as an announcer for road bands while still in his teens, Bob played tenor and soprano saxophones, as well as flute for his high school band. He graduated from Vallejo High School in 1956.